Damian Fisher is a Certified Master Fitness Trainer with over 20 years of industry experience as a Professional Trainer and Consultant. 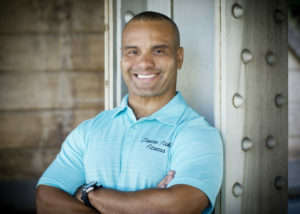 A Graduate of NC A & T State University, Damian has been in the fitness industry since 1997. He has been a Franchise Gym Owner, Training Director and a personal training studio owner. His roots are in personal training, coaching and consulting. His specialty is customized professional fitness training. Workouts designed specifically for you based on your fitness level, age, health, schedule and goals. Whether you are 80 years old striving for independence or 40 … preparing for your first bodybuilding competition or triathlon. Realizing people’s limitation on time and resources, Damian has developed 30 and 45 min. exercise routines for weight loss, muscle toning and increased energy and vitality. Nutrition is a key component of any weight loss or fitness plan Damian’s routines incorporate nutrition consulting with exercise, with amazing results! Damian uses the S.M.A.R.T principle with clients to define goals: “Specific Measurable Attainable Realistic Time driven”.